How do I care for my new interior floor? Concrete stained floors are great and very durable but not indestructible! They can chip and scratch just like anything due to carelessness. We advice our customers to clean “Green” 1/8 vinegar and water with a clean mop its that simple! What are some Advantages of using J P Concrete Creations, INC.
First of all, we want you to enjoy your floor; we work closely with you to achieve the results you envision with the highest integrity. You can feel great about knowing your floor is as clean as you want it to be, AND environmentally safe. Unclean carpets are often the cause or a major factor in causing allergies or asthma. Tile is expensive, costly to repair and it can be hard to keep the grout clean. Hardwood or laminate is usually highly prone to water damage and dents and it is applied with toxic glue. Our product is affordable and easy to maintain and especially great, if you have any kind of pet. What is the technique I see in your gallery that takes my existing concrete and makes it look like flagstone? 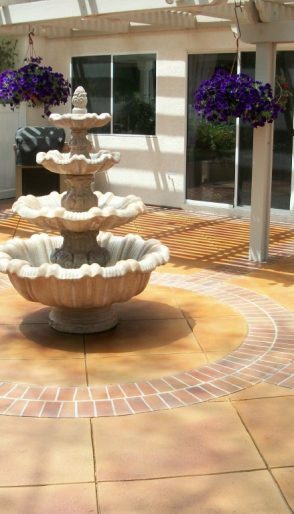 We call it “carved concrete”, we started doing this years ago after we saw many “stamped” concrete jobs start out beautiful only to quickly have old cracks return. So, we decided to make the existing crack your friend and not your enemy. By using the existing cracks as part of the design we are not trying to “fix” them. Some contractors will tell you they are going to fill your existing cracks with their heavy duty magical “resin” and “fix” your crack never to be seen again. If I want to have you Stain my interior concrete, will you remove my carpet, wood, tile or vinyl and dispose of it? I want to also have some Drywall and Painting done. Should I have this done before my floors or after? Before. This is always preferred by us– we like to be the last people in. Dry wall contractors are the messiest of all creatures and can not be trusted to cover your floor properly. We can work around the painting, if necessary. How do they remove the mastic or glue from my existing concrete floor? We will need to have everything moved out of the way (except appliances). Reason being we will stain everything at the same time, not in sections. We will be able to tell you how long the process is once we know the square feet and determine prep work needed. Outdoor work depends on weather & other circumstances as well. Last but not least, I like to work only with individuals who are polite, respectful and are honest. Will I experience this with J P Concrete Creations, INC.? Yes! We feel the same way about our clients, JP Concrete Creations INC strives to provide the best service and ensure our customers are completely satisfied.